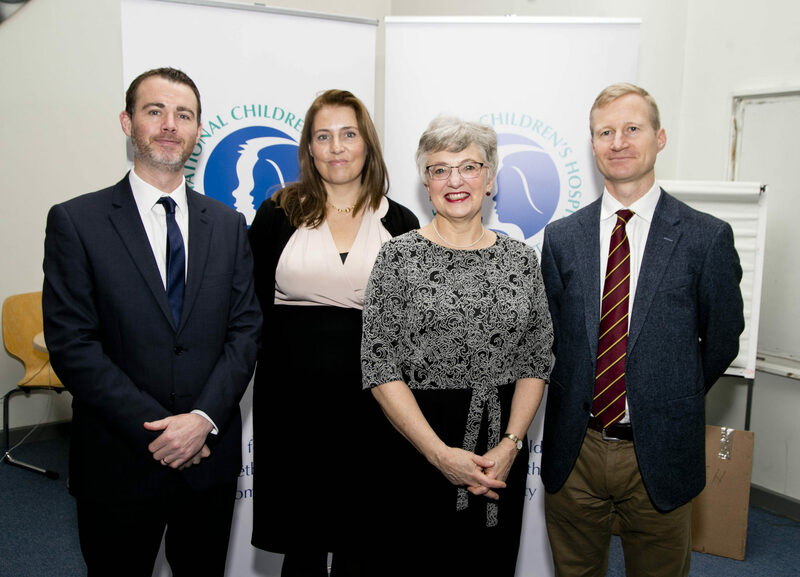 L-R Mr David Slevin, CEO of Hospital, Ms Lillian McGovern,Head of Strategy & Communications, Minister Katherine Zappone and Mr Richard Knatchbull, Chair of the NCH Foundation Research Committee. Speaking at The First Paediatric Study Day organised by the National Children’s Hospital Foundation, in partnership with Trinity College Dublin held on Friday 9 th December, Minister Zappone recognised and congratulated The National Children’s Hospital Foundation on its success and unrelenting ability to come up with new and innovative methods of fundraising and to add critical value to paediatric healthcare in Ireland. Many medicines and treatments were not tested on children and were based on research undertaken solely on adults which was not appropriate, due to the fact that children are physiologically different from adults as they are not fully matured and developed. Without specific research on children, there is a real risk that they will be harmed by procedures or medicines. Therefore, in 1998, the National Institutes of Health in the USA issued a landmark policy requiring investigators to justify the exclusion of children and/or to make appropriate arrangements for their inclusion. The evidence is clear now that we can influence behaviours and lifestyles in children and their parents, which can prevent and protect against disease and bring about changes that are sustained into adulthood (e.g., overweight and obesity). My own Department is supporting The Growing Up in Ireland study which is following the progress of almost 20,000 children across Ireland to help improve our understanding of all aspects of children and their development. Internationally, the greater quantity and quality of paediatric research and trials is associated with major centres rather than smaller research centres. It is important that children are studied in environments that are appropriate for them, by healthcare professionals qualified and experienced in caring for children, and in sufficient numbers to be able to make robust conclusions from their participation. Many different types of child health research are necessary including descriptive studies, pre-clinical and clinical research to find the causes and mechanisms of disease, and to conduct clinical trials to test the effectiveness of medications, health technologies and preventive strategies. This requires investment in a range of disciplines, specialties and sub-specialties and requires an emphasis on interdisciplinary teams, networks and collaboration. It also requires collaboration between paediatric and adult specialists. We have a great opportunity to further children’s research in this country with the development of the new children’s hospital. The primary driver for the development of the new children’s hospital at the St James’s campus is to improve clinical outcomes for the children of Ireland. It will provide specialist care for children from all over Ireland. It will have two paediatric urgent care and outpatient satellite centres, one here on the campus of Tallaght Hospital and another on the campus of Connolly Hospital. To deliver this vision, the facilities for research and innovation will be located at the Children’s Research and Innovation Centre and in the Education and Training Centre in the new children’s hospital on the campus, while further facilities within the hospital will be provided to accommodate patient and staff proximate research activities and value to patients. This clinical-research continuum will enable high impact translational research. The project is on track to transition to the two new Paediatric OPD and Urgent Care Centres at Tallaght and Connolly Hospitals on a phased based in 2018.This is a very exciting time to be involved in paediatric medicine, and research, in Ireland. Your work will help provide an invaluable basis for the delivery of paediatric services and health care for all of our children.